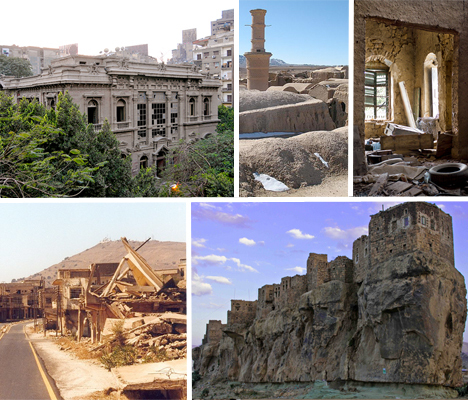 Eerie ghost towns, villages abandoned after shocking massacres, the palaces of deposed dictators and mansions so well preserved they’re like 1950s time capsules are among the Middle East’s abandoned treasures. The Cradle of Civilization and the areas that lie just outside of it contain some of humanity’s oldest structures, and a great many ruins. In 1869, construction of the Suez Canal brought foreign money flooding into Egypt, and ambitious foreign businessmen got to work on ornate castles in Western European style, which stood as stark symbols of colonialism. But when Gamal Abdel Nasser became president in 1956, he put an end to that, kicking out the wealthy foreigners to reclaim the nation for the people. Unfortunately, economic instability hasn’t allowed for the palaces to be redeveloped, so today they range from shuttered time capsules of the 1950s to crumbling ruins. 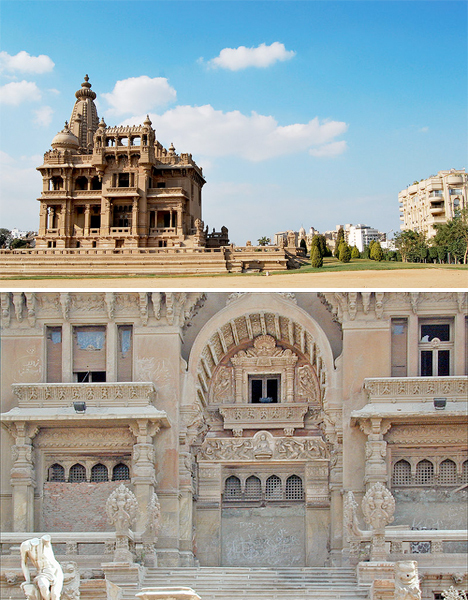 The Baron Empain Palace (top), built by Eduoard Louis Joseph of Belgium in the late nineteenth to early 20th centuries, is one such place. 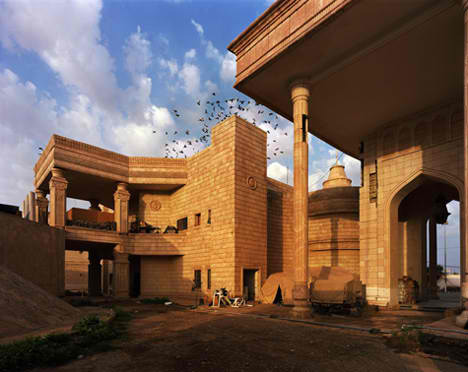 Modeled on Hindu and Cambodian temples, the palace sits in a dirt lot in the Cairo suburb of Heliopolis, surrounded by barbed wire. It’s closed to the public, but like many such places, it’s the subject of many rumors of ghost stories and Satanic rituals. 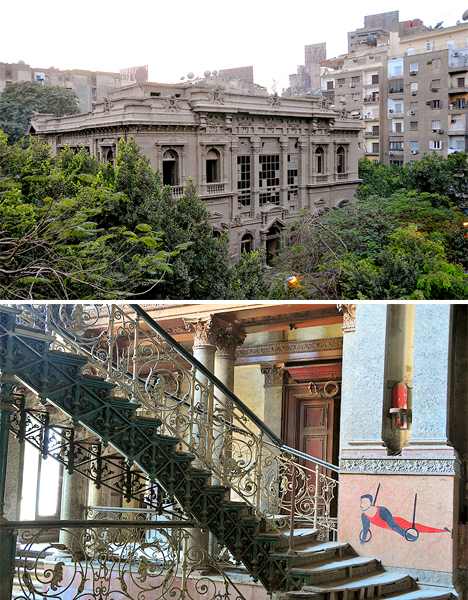 Another is Prince Said Halim’s palace, also known as Champollion House, in Cairo. This palace was converted to a secondary school after its abandonment, but it has been empty since 2004. Located in lush woods just outside the peaceful Al-Shouf Cedar Reserve of Lebanon’s Maasser Cedar Forest, this idyllic village was utterly devastated by the massacre of September 9th, 1983. 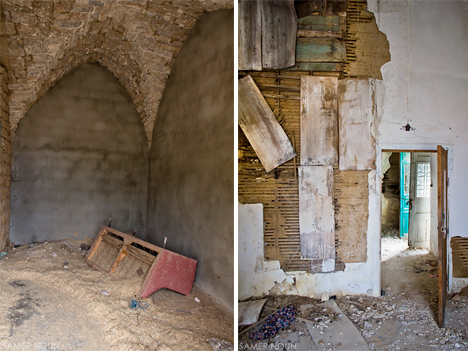 The houses that remain empty belonged to those who perished or fled to safer places when 63 Catholics were killed by their Druze neighbors in a brutal daytime assault. Years later, in 1990, a son left orphaned by the attack returned and killed five Druze villagers and three soldiers in revenge. Some of the homes are still occupied by those who survived. 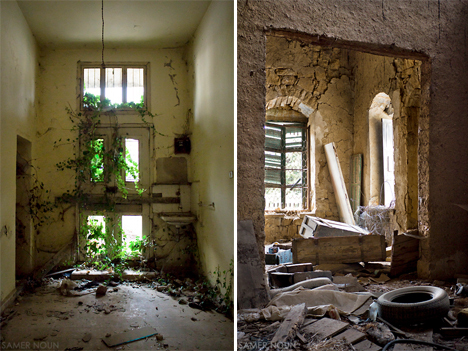 Photographer Samer Noun gained access to the abandoned homes in 2011, capturing these eerie images of the architectural remains. 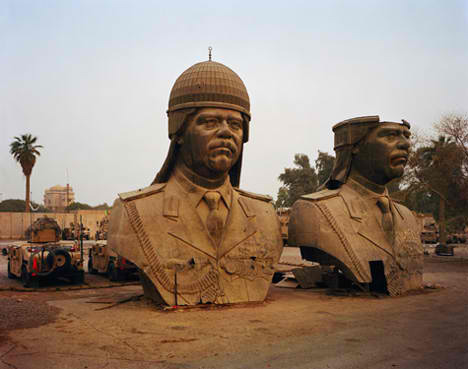 The Babylonian palaces of Saddam Hussein once stood as ostentatious symbols of the Iraqi dictator’s power, hastily constructed all over the country. 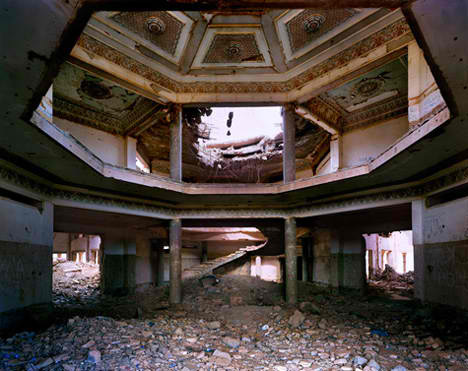 Once he was forced from power, these ornate palaces full of treasures were either taken over by US Army forces or looted by locals. 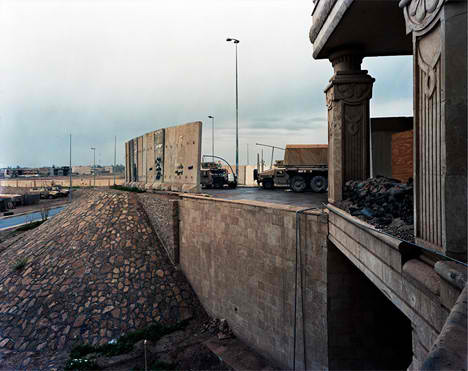 These photos by Richard Mosse document the period in which American soldiers stalked the marble halls, strung up American flags in what were once exclusive chambers and parked their massive military vehicles right in front of the faux-grand entrances. Many of the palaces are deteriorating, and not just because of war damage; they were so cheaply made that they simply haven’t stood up to the test of time.